DAY6 Live & Meet in Jakarta: DAY6 x MY DAY= Mantap! The long wait is finally over! DAY6 finally land for the very first time in Indonesia! Indonesia MY DAY finally can meet up close with their favorite band DAY6 at Balai Sarbini. As the previous day some of fans already met them even closer during fansign, the live & meet brings you to more intimate interaction as they communicate a lot during the show with fans. DAY6 opening the night with ‘How Can I Say’ and ‘I Wait’ marvelously and the endearing compliments from members how Jakarta MY DAY is burning hot and ready to have fun with them. MY DAY’s fanchant are so loud filling up the venue accompanying DAY6 performance. They continue with ‘Whatever!’ and ‘What Can I Do’ before finally into the talk and game segment. The boys greeted fans in some fluent Bahasa, Sungjin: “Selalu denganmu” (always be with you) and the main keywords for today’s show from Wonpil: “I’m Wonpil, MY DAY mantap!” (MY DAY awesome!). YoungK also show his overwhelming feels on how MY DAY voice can reach into their backstage and once again, mantap! Members also get to choose their fave MV, instead of choosing the previous MV, YoungK revealed he like the upcoming MV. Surprise event, YoungK sang a part of Indonesia pop song by NOAH titled Separuh Aku (Half of Me) bringing wows from fans for his great pronunciation and notes. Fans can’t help but singing along with him. The surprise is not only for MY DAY, but also for the birthday boy, Dowoon! They brought the birthday cake on stage and celebrating his birthday, Dowoon glad that he could celebrate his birthday party in Jakarta with fans! Yes we too! The live & meet couldn’t be completed if the message corner section is not on. The members can make an impromptu performance based in the message written by fans, they’re indeed a great composer, you agree with me MY DAY? The last game section, DAY6 need to wear Batik with their eyes closed. All members looking good in Batik and they even complimented each other as they look good in the suit. The show continues to ‘You Were Beautiful’ and ‘I Smile’ then finally to the final song, but wait! Fans prepared a heart warming video to celebrate DAY6 2nd anniversary and Sungjin hope DAY6 could be together for the next 20 years and fans will stay along with them. ‘Congratulations‘ is performed, fans prepared a colorful project and the venue become a rainbow in instant. MY DAY still don’t want to get apart from DAY6, Jae shouted “You want more?” to the audience, there’s no way we will say no right? The members back on stage performing ‘장난 아닌데’, ‘Dance Dance’, and ‘Freely’ before finally really ending the show. 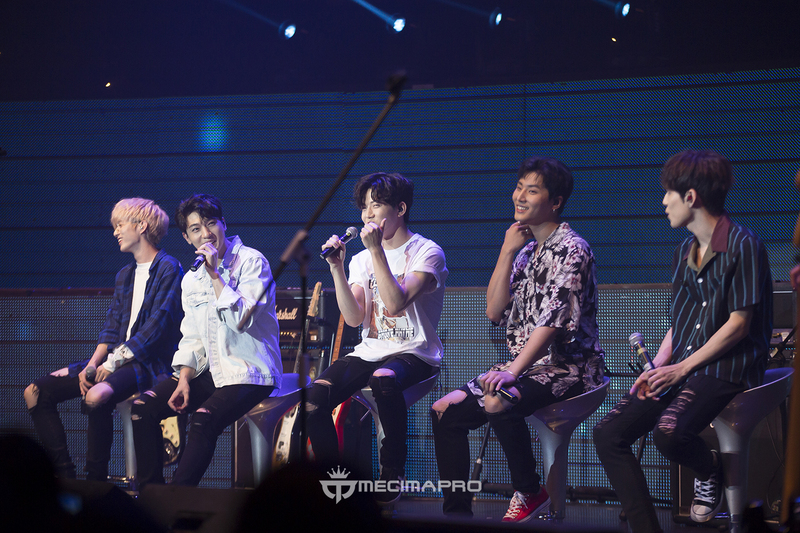 DAY6 thanking fans for the unforgettable night and promise to be back to Jakarta! See you again! We would like to thank MecimaPro for the invitation and finally bringing DAY6 to Indonesia! Can’t wait for the next project!